Bear Bear the Fearsome Rottie: 10,000 Euros to be saved... We wouldn't have charged a Cent. 10,000 Euros to be saved... We wouldn't have charged a Cent. 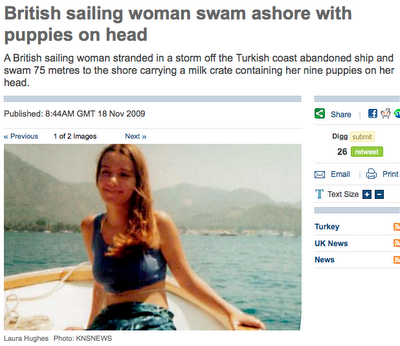 In November 2009, this woman who was in trouble at sea, was made to swim 100 metres to shore... with a crate of Rottie puppies on her head... her two other dogs and her friend also made it. Tired but not hurt. What was so terrible was that there was help at hand... and that the tug boat that went out the help them, DEMANDED €10,000!! Humans can get pretty ugly. Some of them deserves to be bitten I am sure of it. Laura Hughes, 28, braved waves up to five metres high as she struck out for a beach on the Greek island of Rhodes. Her 14 and a half foot boat had been pushed around the Turkish coast by powerful gale force winds leaving her close to the Greek island of Rhodes. She was left completely helpless after a rope from her boat's sails got caught in the boat's propeller and the engine stopped working. After being pushed miles around the coast and fearing her boat would sink or capsize, Miss Hughes had no other option but to abandon ship - and swim 75 metres to the shore. Miss Hughes, from Bedford, had acquired her boat 'Csavargo' from a friend who had salvaged it in Madagascar. After completing an MA in Media and Art at the University of Westminster in January 2009 she had spent the summer sailing along the Turkish coast. Miss Hughes took her two dogs Ragga Muffin and Tiger Lily along for company and was later joined by her friend John Cochrane, 30, in September. The former gave birth to nine puppies during the voyage. It was while trying to anchor the boat amid a storm that the rope from the sails got caught in the boats propeller leading to the engine malfunction. Miss Hughes tried desperately to control the steering wheel but the boat was travelling at a speed of 2.3 knots - and there was no way of stopping it. After several hours, Miss Hughes found herself stranded in a busy shipping lane three miles off the coast of Rhodes. Worried that they would crash into another boat, she sent out a May Day distress signal over the ship's VHF radio. However when help arrived in the shape of a Greek tug boat, they demanded 10,000 euros to rescuing them - and Miss Hughes didn't enough have money to pay them. 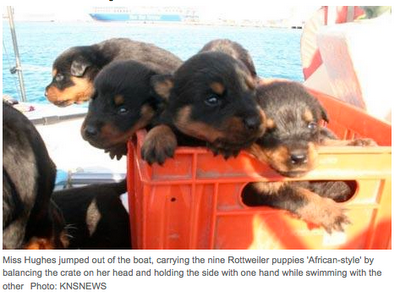 So, wearing a lifejacket, Miss Hughes jumped out of the boat, carrying the nine Rottweiler puppies 'African-style' by balancing the crate on her head and holding the side with one hand while swimming with the other. Mr Cochrane and the two adult dogs also jumped off the boat and swam to the nearest beach at the Greek resort of Lalissos about 100 metres from their boat.When they got to the shore, exhausted, they were helped by German tourists from a beach hotel and members of the emergency services. The British Embassy found Laura and John a hotel room for the night - and the puppies spent the night at a local Greek police station. The next day local fishermen rescued Laura's boat which had been washed up on some nearby sand dunes.